You might have seen this one before if you bought Vol2. Jesus and Mo need a holiday. They will be back when they have recovered. and I, Mo, am his prophet. What has happened to the boys’ iMac?? Don’t tell me they are moving to the dark side!!!! ooppps just realised that’s their TV!!!!
? ?… didn’t got this one… yes I know what a haiku is, but the pun eludes me. True Neutral: read it again, counting the syllables as you go. I like this strip. enough to emulate it? Sure! Sometimes the meaning eludes me, but I got this one from the second frame. Cute, but I’m not sure what it has to do with jam… maybe that’s the part I’m missing? Subtle making the toon itself a haiku but, for True Neutral and others, I would assume the point is that Muzzies generally have zero knowledge of Infidel art/literature. 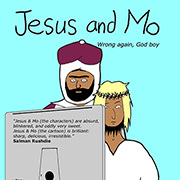 Am I the only one to understand from Author’s preface that we are losing Jesus and Mo for the time being. Tell me I’m wrong. Very subtle, and very well done. Yeah, Jude, it sounds like it. Wonder for how long? Thanks falterer, finally got it, very subtle indeed. This is awesome. I had to count on my fingers twice then actually look up on wikipedia because i wasn’t sure if it was 5, 7, 5; or 7, 5, 7. Oh my God, now he’s offended the Apple fans! He’s really in for it now! In Japanese “haiku” has three syllables (????? ).